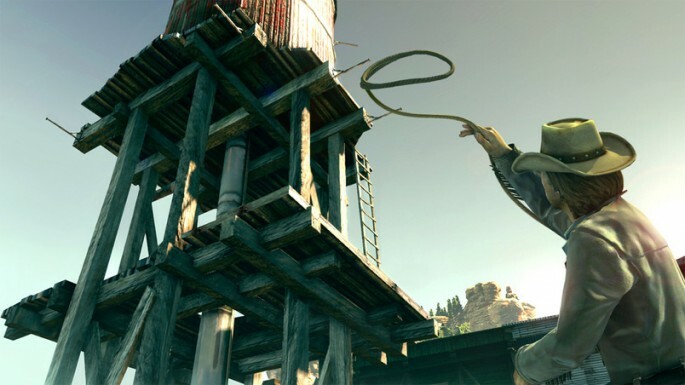 Call of Juarez: Bound in Blood is the latest cowboy title to hit this round of consoles. 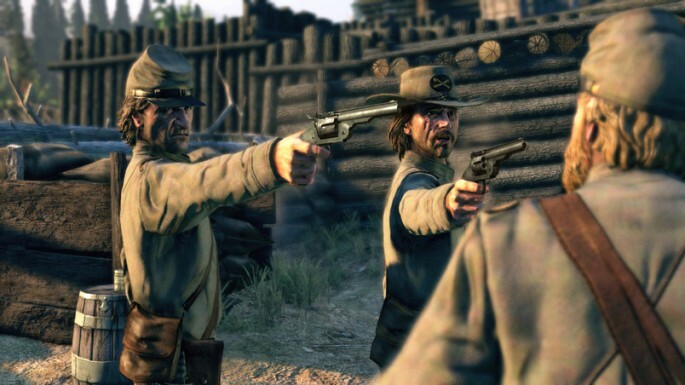 The first title in the series, simply called Call of Juarez, released in 2006 on the Xbox 360 and was met with positive reviews. Bound in Blood is a prequel, set before the events of the original Call of Juarez title. The game places you in the shoes of Thomas and Ray McCall, former Confederate soliders who deserted the Civil War to protect their home from the Union forces. Both brothers feature different gameplay perks, such as Ray’s ability to use the portable Gatling gun, and Thomas’ ability to use the lasso. Both brothers bring great gameplay elements to the table, with Ray being the more powerful one, and Thomas being the more stealthy one. The game is full of action-packed set pieces, allowing the player to do everything from blasting soldiers with pistols while riding on a horse to shooting cannons at soldiers as they cross a river. The action in this game is non-stop, all the way until the very end. Now as strange as this sounds, the fact that the game is so packed with repetitive action after these few great moments is disappointing. Basically, you’ll get your objective, shoot your enemies, and get a new objective. Moments like riding on the back of a wagon, shooting a Gatling gun while the native Indians chase you on horseback is one of the coolest parts of the game. And yet I was left wondering why so many other missions weren’t as exhilorating. It’s really the lack of downtime or breathing room that makes this issue stand out. What does break up the monotony is the great story and dialogue. Because this is a prequel, characters from the first game can have very different relationships than the prior events. For example, the villain from the first game has a very different role and relationship in Bound in Blood. It’s interesting to see these prior events, and working with a future villain is a nice treat. The dialogue in the game is very well done, with top-notch voice acting and witty lines from both Thomas and Ray. The characters themselves are very different. Ray is a more aggressive type, while Thomas is more contemplative and quiet. This also comes out in gameplay, as said before how Ray is the stronger one, while Thomas is the more crafty, stealthy brother. Though the title may be a prequel and does tie into the last Call of Juarez title, it’s still fun to see the brothers in their younger hey-days. Both cutscene and gameplay graphics are spot on. Character models look fantastic, however, lip-syncing in the game is off. When you hear a character say something, it looks almost entirely different when the mouth moves. The environments look fantastic, and are sometimes breathtaking. Forest scenes in the game really shine, and you can tell that the development team at Techland put a lot of hard work into the environments. However, I did notice a few oddities that skewed the realism of the environment, such as the ability to not walk through certain bushes. Also, when doing in-game cutscenes, little graphical errors occur. One segment involved riding a boat, you will be standing inside of it and shooting at enemies. When all the enemies were killed, I happened to look down at my feet, and spun around the analog stick. Obviously, the developer was not anticipating that I would look down at my feet while in a boat, and instead watch out for enemies. I knew this because my feet actually went through the boat. Little mistakes like this sort of kill the mood. Another mistake that the developers chose to make were checkpoints that actually freeze the gameplay. This isn’t the same as loading in the middle of a level, as Chronicles of Riddick does, but it’s still annoying, and something that should be done in the background while the gameplay is going on.